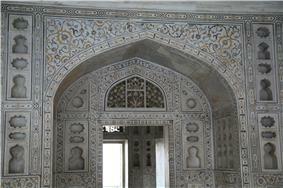 Complex Arabesque inlays at the Agra Fort in the Mughal Empire. The arabesque is a form of artistic decoration consisting of "surface decorations based on rhythmic linear patterns of scrolling and interlacing foliage, tendrils" or plain lines, often combined with other elements. It usually consists of a single design which can be 'tiled' or seamlessly repeated as many times as desired. Within the very wide range of Eurasian decorative art that includes motifs matching this basic definition the term "arabesque" is used consistently as a technical term by art historians to describe only elements of the decoration found in two phases: Islamic art from about the 9th century onwards, and European decorative art from the Renaissance onwards (see Arabesque (European art)). Arabesques are a fundamental element of Islamic art but they develop what was already a long tradition by the coming of Islam. The past and current usage of the term in respect of European art can only be described as confused and inconsistent. 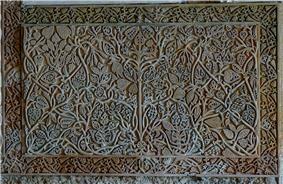 Some Western arabesques derive from Islamic art, but others are closely based on Ancient Roman decorations. In the West they are essentially found in the decorative arts, but because of the generally non-figurative nature of Islamic art arabesque decoration is there often a very prominent element in the most significant works, and plays a large part in the decoration of architecture. Early Islamic art, for example in the famous 8th century mosaics of the Great Mosque of Damascus, often contained arabesque patterns. The plants most often used are stylized versions of the acanthus, with its emphasis on leafy forms, and the vine, with an equal emphasis on twining stems. Arabesque patterns also decorated everyday items such as cups and containers. The evolution of these forms into a distinctive Islamic type was complete by the 11th century, having begun in the 8th or 9th century in works like the Mshatta Facade. In the process of development the plant forms became increasing simplified and stylized. Though the broad outline of the process is generally agreed, there is a considerable diversity of views held by specialist scholars on detailed issues concerning the development, categorization and meaning of the arabesque. The detailed study of Islamic arabesque forms was begun by Alois Riegl in his formalist study Stilfragen: Grundlegungen zu einer Geschichte der Ornamentik (Problems of style: foundations for a history of ornament) of 1893, who in the process developed his influential concept of the Kunstwollen. Riegl traced formalistic continuity and development in decorative plant forms from Ancient Egyptian art and other ancient Near Eastern civilizations through the classical world to the Islamic arabesque; while the Kunstwollen has few followers today, his basic analysis of the development of forms has been confirmed and refined by the wider corpus of examples known today. Jessica Rawson has recently extended the analysis to cover Chinese art, which Riegl did not cover, tracing many elements of Chinese decoration back to the same tradition; the shared background helping to make the assimilation of Chinese motifs into Persian art after the Mongol invasion harmonious and productive. Claims are often made regarding the theological significance of the arabesque, and its origin in a specifically Islamic view of the world; however these are without support from written historical sources as, like most medieval cultures, the Islamic world has not left us documentation of their intentions in using the decorative motifs they did. At the popular level such theories often appear uninformed as to the wider context of the arabesque. In similar fashion, proposed connections between the arabesque and Arabic knowledge of geometry remains a subject of debate; not all art historians are persuaded that such knowledge had reached, or was needed by, those creating arabesque designs, although in certain cases there is evidence that such a connection did exist. The case for a connection with Islamic mathematics is much stronger for the development of the geometric patterns with which arabesques are often combined in art. Geometric decoration often uses patterns that are made up of straight lines and regular angles but are clearly derived as a whole from curvilinear arabesque patterns; the extent to which these too are described as arabesque varies between different writers. 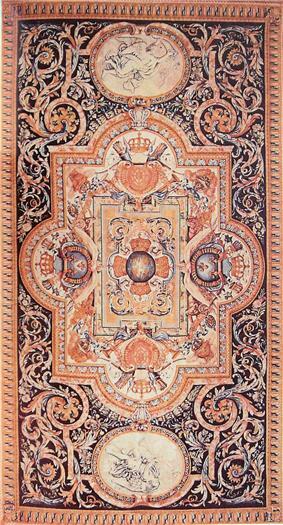 The arabesques and geometric patterns of Islamic art are often said to arise from the Islamic view of the world. The depiction of animals and people is generally discouraged, which explains the preference for abstract geometric patterns. There are two modes to arabesque art. The first recalls the principles that govern the order of the world. These principles include the bare basics of what makes objects structurally sound and, by extension, beautiful (i.e. the angle and the fixed/static shapes that it creates—esp. the truss). In the first mode, each repeating geometric form has a built-in symbolism ascribed to it. For example, the square, with its four equilateral sides, is symbolic of the equally important elements of nature: earth, air, fire and water. Without any one of the four, the physical world, represented by a circle that inscribes the square, would collapse upon itself and cease to exist. The second mode is based upon the flowing nature of plant forms. This mode recalls the feminine nature of life giving. 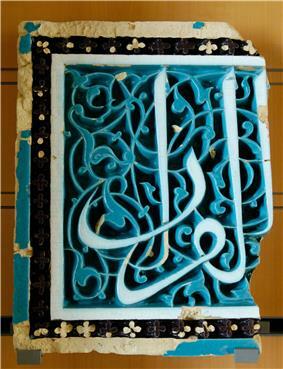 In addition, upon inspection of the many examples of Arabesque art, some would argue that there is in fact a third mode, the mode of Arabic calligraphy. 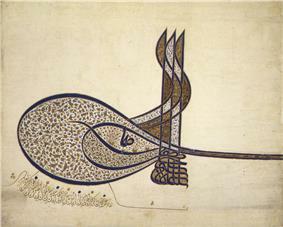 Ottoman tughra of Suleiman the Magnificent, 1520, with flowers and saz leaves. The arabesque may be equally thought of as both art and science. The artwork is at the same time mathematically precise, aesthetically pleasing, and symbolic. Due to this duality of creation, the artistic part of this equation may be further subdivided into both secular and religious artwork. However, for many Muslims there is no distinction; all forms of art, the natural world, mathematics and science are all seen to be creations of God and therefore reflections of the same thing: God's will expressed through his creation. In other words, man can discover the geometric forms that constitute the Arabesque, but these forms always existed before as part of God's creation, as shown in this picture. The term was first used in the West in Italian, where rabeschi was used in the 16th century as a term for "pilaster ornaments featuring acanthus decoration, specifically "running scrolls" that ran vertically up a panel or pilaster, rather than horizontally along a frieze. From there it spread to England, where Henry VIII owned, in an inventory of 1549, an agate cup with a "fote and Couer of siluer and guilt enbossed with Rebeske worke", and William Herne or Heron, Serjeant Painter from 1572 to 1580, was paid for painting Elizabeth I's barge with "rebeske work". Unfortunately the styles so described can only be guessed at, although the design by Hans Holbein for a covered cup for Jane Seymour in 1536 (see gallery) already has zones in both Islamic-derived arabesque/moresque style (see below) and classically-derived acanthus volutes. Over the following centuries the three terms grotesque, moresque and arabesque were used largely interchangeably in English, French and German for styles of decoration derived at least as much from the European past as the Islamic world, with "grotesque" gradually acquiring its main modern meaning, related more to Gothic gargoyles and caricature than to either Pompeii-style Roman painting or Islamic patterns. Meanwhile the word "arabesque" was now being applied to Islamic art itself, by 1851 at the latest, when John Ruskin uses it in The Stones of Venice. Writers over the last decades have attempted to salvage meaningful distinctions between the words from the confused wreckage of historical sources. Fuhring notes that grotesques were "confusingly called arabesques in eighteenth century France", but in his terminology "the major types of ornament that appear in French sixteenth century etchings and engraving ...can be divided into two groups. The first includes ornaments adopted from antiquity: grotesques, architectural ornaments such as the orders, foliage scrolls and self-contained elements such as trophies, terms and vases. A second group, far smaller than the first, comprises modern ornaments: moresques, interlaced bands, strapwork, and elements such as cartouches...", categories he goes on to discuss individually. ^ Alexenberg, Melvin L. (2006). The future of art in a digital age: from Hellenistic to Hebraic consciousness. Intellect Ltd. p. 55. ^ Richard Ettinghausen, Oleg Grabar, and Marilyn Jenkins-Madina, Islamic Art and Architecture, 650-1250. (New Haven: Yale UP, 2001), 66. ^ Osbourne, 34 (quoted), see also OED quoted below and Cotgrave - Osborne says the French usage begins in the "latter part of the 17th century" but in the following paragraphs describes a development beginning rather before this.